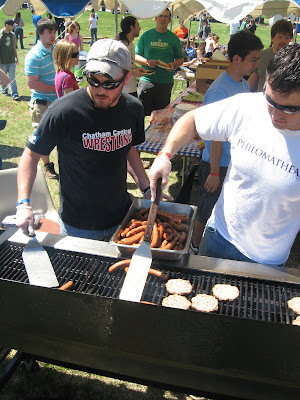 The Catawba College Philomatheans manned the grill all day. It's rare that I get to enjoy grilled food without actually doing the grilling, so this was a treat. 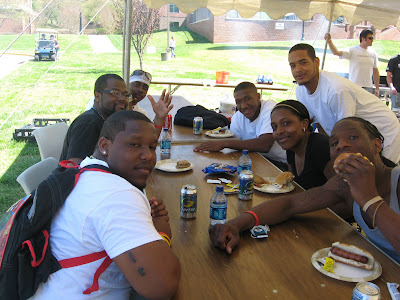 Here are some of my students enjoying grilled burgers and hot dogs. I've taught most of them. The others - hint - need to sign up for public speaking or journalism. Justin has taken several of my classes. He's one of our majors in Communication Arts. He took a break from helping out with the visiting bands. 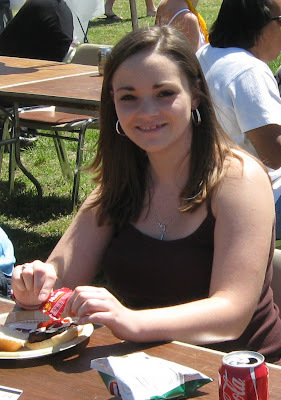 This young lady is enjoying a grilled burger in the sun. We usually end up with some rain on Catawbapalooza day, but this year could not have been any nicer. I think the temperatures hit the upper 70s. It was definately a shorts and t-shirt day. Just when I get to know Sally, she's graduating. She and her friend tie dyed their Catawbapoolza t-shirts which turned out really great. I love it when our students get creative. 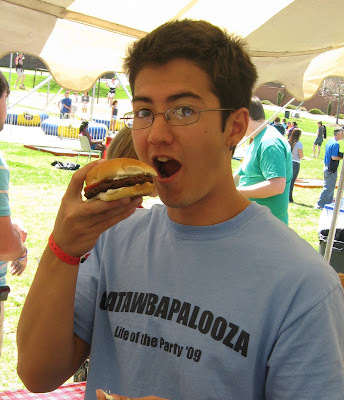 I'm just back from Catawbapoolza at Catawba College, and it was a really wonderful day of food and fun. 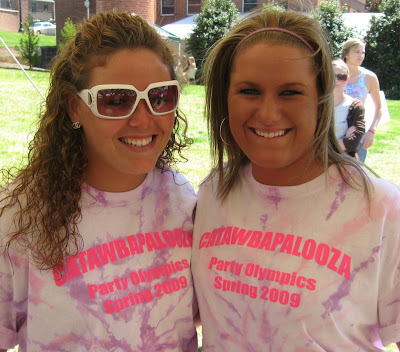 I always enjoy Catawbapoolza, but this was the sunniest and warmest one I remember. The students do a lot of the planning and work for this yearly spring event at the college. I must also give a shout out to Jan Gillean of, the Director the Student Center, who helps coordinate this and other campus student events. I'll bet she will be wiped out tonight. If you ever have to plan a big party event, you will find that you need a lot of hands. Our college spring party just couldn't happen without so many students pitching in. Different clubs on campus take turns with various booths and also with the grilling. The Philomatheans always take care of cooking the burgers and hot dogs. Other groups on campus help with the sign in tent, games, and other food booths. I took the time to thank a couple of students today. They told me that they enjoy helping out. The college students also do volunteer work in the community ranging from helping at the homeless shelter to pitching in with Special Olympics. If you work with a non-profit agency or need help in your community, check with your local college. Our young people have loads of energy and can make a huge difference. They are funny, creative, and they can light up events with big smiles and can-do attitudes.